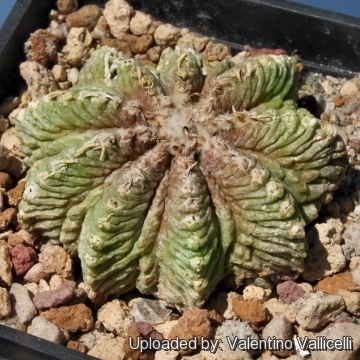 Aztekium ritterii is unlikely to be mistaken for any other species. 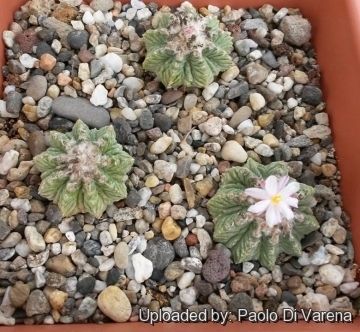 It grows extremely slowly (about only 1mm per year! ). 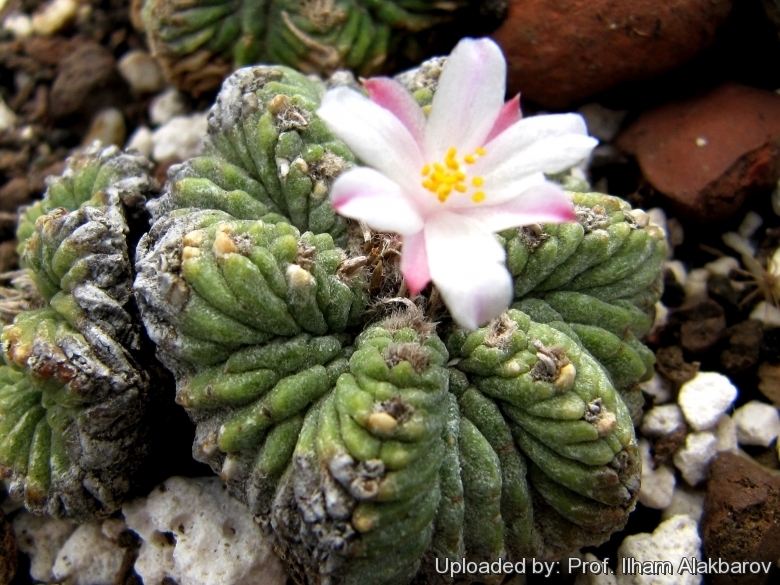 This plant is considered a sacred plant for some Mexican tribes. 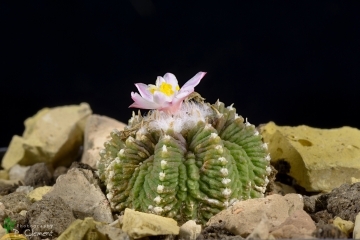 The name of this genus refers to the similarity of the plant with Aztec sculpture designs. 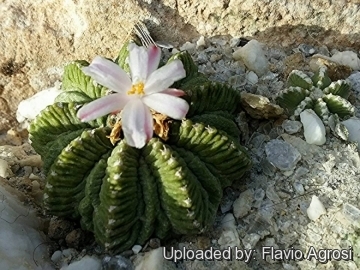 Origin and Habitat: Aztekium ritteri is endemic to the Mexican state of Nuevo León. Early observations indicated that this species was restricted to one or two localities in the Valley of Rayones. More recently, several additional subpopulations have been found and evaluated. Large numbers of plants occur in these several sites, many of which are largely inaccessible. Altitude range: 800-1060 metres above sea level. Habitat: It occurs in xerophile shrublands in the semi-desert in vertical cliffs of friable limestone together with Mammillaria winteriae. Elsewhere it has been reported growing on similarly steep gypsum faces. The plant appears to favour north facing slopes rather than those with a sunnier aspect. This species is threatened by illegal collecting, however, some populations of the species are protected by growing on inaccessible cliffs. It is also threatened by natural erosion processes that wash away habitat. 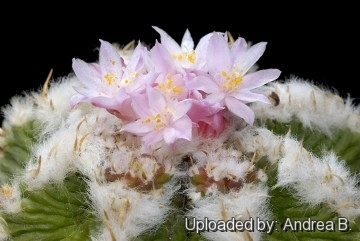 Description: Aztekium ritteri is a tiny globular cactus, seldom exceeding 5 cm in diameter and rather less in height, with 9 to 11 rounded ribs, these are in turn crossed by numerous horizontal furrows. Between these true ribs are small secondary ribs, reaching about halfway up the plant body. The colour of the younger growth is a rather pale yellowish green, merging to grey-green on the lower, older growth. 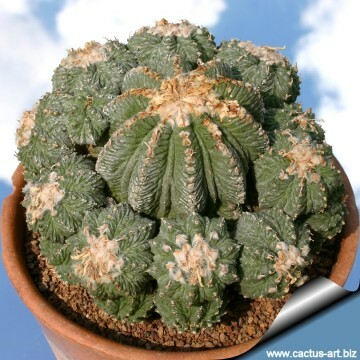 The centre of the cactus contains a lot of white wool. 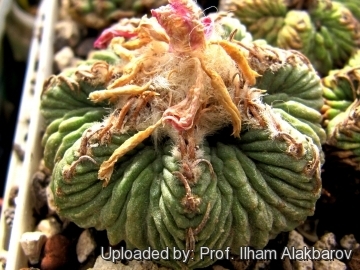 Once the plant body has reached full size it slowly offsets, and small clumps are commonly found. It does not develop a large storage root. 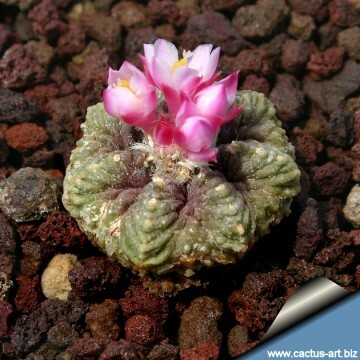 Aztekium ritteri Photo by: Andrea B.
Cultivation and Propagation: Aztekium are by far the most challenging and difficult cactus to grow, they are of extremely slow growth - probably the slowest of the entire cactus family. They usually take several years for growth to be even noticeable. Once a specimen is established on its own roots it is no trouble to keep it ,and becomes an easy plant to manage. Water requirements: They need good drainage and regular water in summer. They should be dried out completely for their winter rest when they will withstand temperatures down to to -4°C for short periods. Light requirements: They prefer some shade. Propagation: It usually multiplies by seeds. The seeds are extremely fine and germinate readily, but the seed germination rate is very low for everyone (less than 5%). The minute seedlings are very sensitive for the first two months. But many of them perish, and taking them to a viable size is very difficult. The seedling are so small that a drop of water moves them like crazy. They are usually grafted to increase growth speed. In any case, grafting produces rather atypical plants which tend to be more obese and to offset much more readily than plants growing on their own roots. The offsets of grafted plants are often produced from areoles high up on the plant body, rather than at ground level. It is also possible to root the offsets from grafted plants, but with little success.